Four active regions were reported by NOAA today. However, the two strongest flares of the past 24 hours did not occur in any of them. The C1.9 flare peaking at 03:36 UT today took place behind the north-west limb. The C3.8 flare peaking at 00:07 UT today was associated with a filament eruption in the south-east quadrant (to the south of NOAA ARs 2319 and 2320). A partial halo CME was associated with this flare. It first appeared in the SOHO/LASCO C2 field of view at 23:36 UT on April 4, had the angular width of at least 230 degrees and projected plane-of-the-sky speed around 760 km/s. SDO/AIA data show that the CME was also accompanied by coronal dimmings and a post-eruption arcade. The bulk of the CME material is directed eastward of the Sun-Earth line, so we expect only a glancing blow from this CME (probably the CME-driven shock) late on April 7 or early on April 8. More C-class flares are expected, especially in the NOAA AR 2320. The Earth is currently inside a solar wind flow with intermediate speed (around 520 km/s) and the interplanetary magnetic field magnitude of around 6 nT. 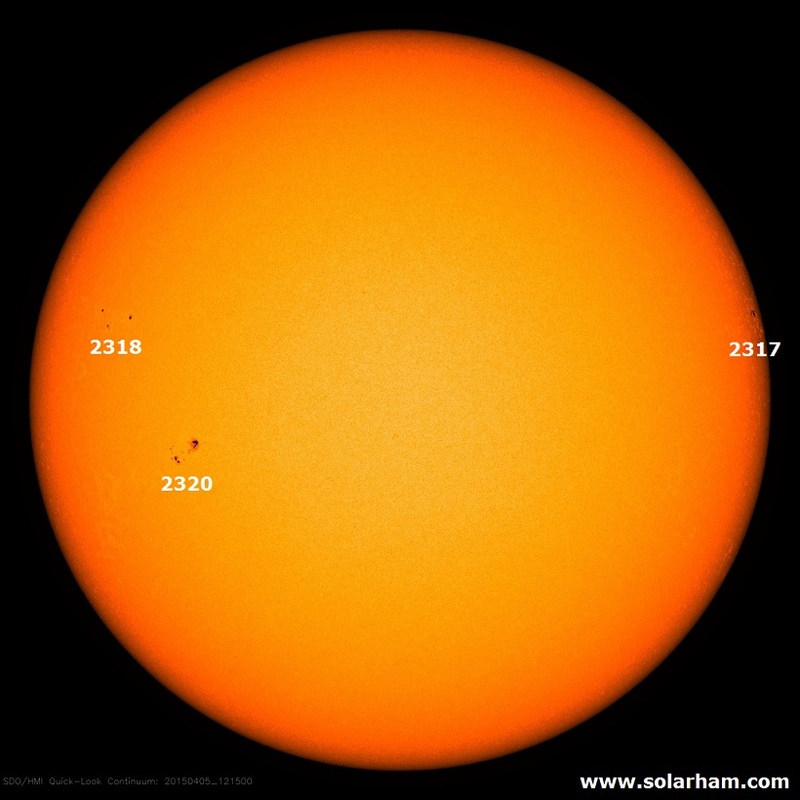 The geomagnetic conditions are quiet to unsettled (K < 4) and are expected to remain so.